New Quay - 'Cei Newydd', with Its picturesque houses, pubs and restaurants clings to the sides of the hills rising above the blue waters of Cardigan Bay on the coast of West Wales. 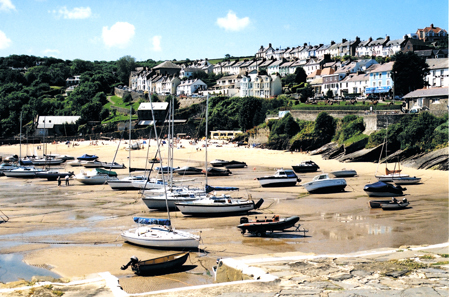 The town has narrow streets rising in terraces - between several of which were 'ropewalks' for twisting rope in New Quay's heyday as a shipbuilding centre The sheltered harbour and safe beaches - the focus of activity in the summer when New Quay becomes a bustling and vibrant holiday resort where sailing, fishing, water sports and relaxation, are among the main attractions. 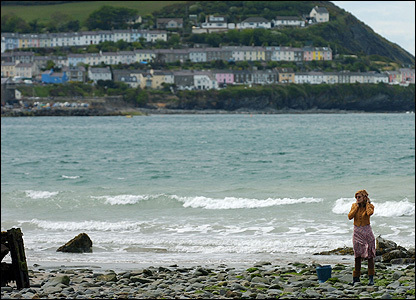 Many who come to stay in or near New Quay are interested in seeing wild Dolphins, for in all of Britain, the New Quay area is probably the best place to see them. In the New Quay / Llangrannog area they can be seen from the shore and from boats which take groups out from New Quay on a regular basis. 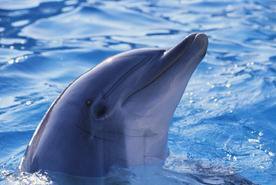 One cannot guarantee to see the Dolphins on a given day, but the chances are good for the dedicated Dolphin watcher. Information on sightings can be found at The Cardigan Bay Marine Wildlife site.